FRANKFORT, Ky. (AP) - The Kentucky distillery worker who's accused of leading a bourbon theft ring wore shirts promoting the distillery where he worked - and also stole liquor - as he delivered purloined barrels covered by a tarp in a pickup truck, a detective said. The ring that prosecutors say was led by Gilbert "Toby" Curtsinger operated for years and turned into a lucrative business, said Franklin County sheriff's detective Jeff Farmer. "He made a lot of money off of it," Farmer said. Curtsinger was among nine people indicted Tuesday on charges of spiriting away large volumes of whiskey, by the bottle and the barrel. Curtsinger often relied on go-betweens to find customers, Farmer said. Some middle men are among the people under indictment, he said. The group often made connections through softball tournaments, he said. Prosecutors say the scheme involving tens of thousands of dollars' worth of whiskey began to unravel when bourbon barrels were discovered behind a shed. The theft targeted the Buffalo Trace and Wild Turkey distilleries, prosecutors said, and included some prestigious brands, such as pricey Pappy Van Winkle bourbon. It had been going on since 2008, officials said. "You had some rogue employees who took advantage of both the trust of their companies and their knowledge of the security measures to steal the barrels and bottles of bourbon from these two distilleries," said Zachary M. Becker, an assistant Franklin County prosecutor. Sheriff Pat Melton estimated the recovered whiskey alone is worth at least $100,000. All nine defendants are charged with engaging in organized crime as members of a criminal syndicate. Two of them worked at the Buffalo Trace distillery and one worked at Wild Turkey, authorities said. Curtsinger would present himself to customers as a Buffalo Trace employee and never gave any indication the whiskey was stolen, Farmer said. "He never beat around the bush about who he was," the detective said. Sometimes he sold a barrel to a middle man, who then marked it up a couple hundred dollars and resold it, Farmer said. In one instance, a go-between connected Curtsinger with a pair of farmer-brothers in Harrison County, Farmer said. An early transaction was for a bottle of hard-to-get Pappy Van Winkle whiskey. "That led into, 'Hey, he's also got some barrels of whiskey for sale,'" he said. Curtsinger delivered two barrels to the brothers, the detective said. Authorities found the barrels, one nearly empty, in a hunting trailer, he said. Stolen barrels were stashed, sometimes in a barn, until customers were found. The indictments tied together the theft of barrels of Wild Turkey whiskey revealed this year and the disappearance of Pappy Van Winkle bourbon dating back to 2008 or 2009. Pappy Van Winkle is made at the Buffalo Trace distillery. Becker said 15 recovered barrels were confirmed to hold Wild Turkey whiskey. Two other stolen barrels appeared to be filled with whiskey made at Buffalo Trace, Becker said. Barrels were worth $3,000 to $6,000, depending on the type and age of whiskey, but the theft ring sold them for $1,200 to $1,500 apiece, officials said. 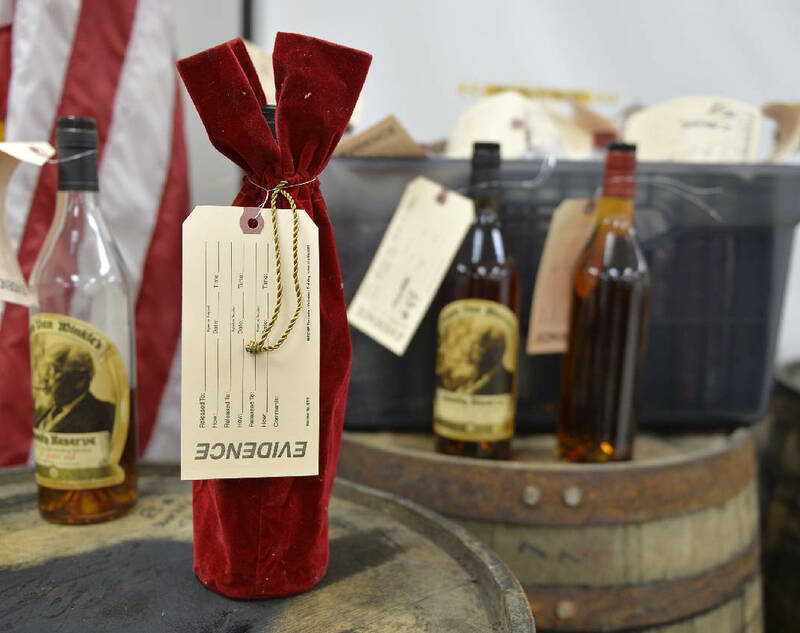 The heists included more than 20 cases of Pappy Van Winkle bourbons, 50 to 70 cases of Eagle Rare bourbon and other barrels of whiskey that were stolen but not recovered, Becker said. One recovered barrel contained 17-year-old Eagle Rare bourbon valued at $11,000 to $12,000. Investigators talked to buyers, authorities said. "We did have several calls and we had people come forward and say, 'Hey, I think I got one of these barrels,'" Melton said Tuesday. The investigation accelerated this year when authorities found several bourbon barrels by a shed behind Curtsinger's home in Franklin County. Curtsinger was arrested and has pleaded not guilty to multiple offenses, including receiving stolen property over $10,000. Curtsinger also is accused of trafficking in anabolic steroids. His wife, Julie Curtsinger, was also indicted. Attorneys for the Curtsingers said they are in the early stages of preparing a defense. In a joint statement, Buffalo Trace and Wild Turkey said they cooperated fully and thanked investigators. Authorities said the investigation is continuing.